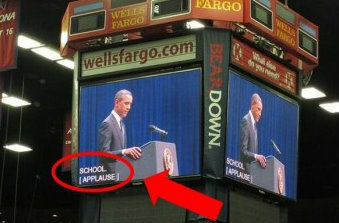 Teabaggers Claim Obama Commanded Applause At Tucson Memorial - Joe.My.God. Over the weekend reichwing and widely-read Tea Party bloggers began claiming that the reason we heard so much applause at the memorial for Tucson’s shooting victims is because audience members were “commanded” to do so by the arena’s Jumbotron, which, of course, was secretly being run by the Obama administration. In fact, the Jumbotron operator was live-captioning the event for hearing-impaired members of the audience. Parenthetical notations like “(applause)” and “(music)” are always used when such moments occur. The bloggers in question know this, but continue their shameless campaign.